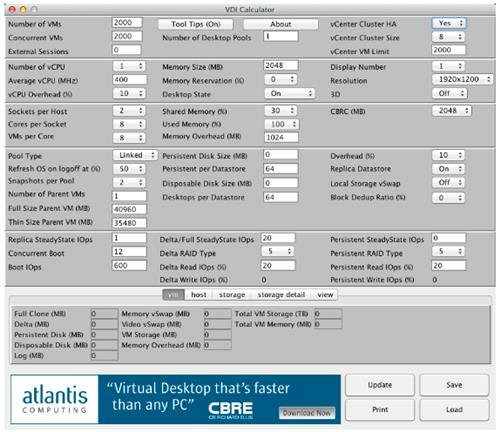 Andre Leibovici at myvirtualcloud.net has today released the latest version of his very useful VDI Calculator tool. The new calculator is built on Java framework (Java 6 or later required) instead of Flash, and will run on both Windows and Mac computers. The new calculator has all the features available in the previous flash version plus new key features that will make life easier for many users. Offline Support – The new version will be able to run when disconnected from the network. When connected, it will auto-update itself with the latest release. Load/Save – Now you can save and load your configurations eliminating repetitive task of entering the values every time you use the calculator. This is a great future for consultants that have to manage multiple projects for multiple customers. Tool Tips – When you hover over a field or combo box you see an explanation what exactly that property will do. Validations – Property validations have been added to reduce the number of possible errors. These validations include checking your numbers are within VMware’s supported numbers. It’s FREE!!! – Thanks to the sponsors this tool is absolutely FREE, even for the mobile version that will be soon released. If you are a vendor and is interested in having your Ad dynamically presented on the calculator just send an email to at andre_leibovici@yahoo.com. Drop down for some “canned” reference architectures (such as a 8-blade UCS chassis (HP, EMC, Netapp, IBM, Nutanix etc) and the usually set up for pools/Vms). I hope everyone finds this tool as handy as I have and I would like to thank Andre for all the hard work in the development.